Trigger Happy is a video slot game from Realtime Gaming (RTG), and while you’d be forgiven for thinking it’s based around the popular TV show of the same name, it’s actually a Wild West-inspired video slot. Learn all about it and what it has to offer here, in our Trigger Happy slot review! RTG is known for its innovative themes and game mechanics, but Trigger Happy is based on a relatively common theme – the old Wild West. The game’s playable from between R0.90 and R150 per spin and this means players on all budgets can enjoy the game’s action. Visually, the game is in-line with most of the developer’s slots, and you’ll see the reels are set upon a desert scene. We’re going to jump right into looking at the main bonuses and features within the slot, as this appears to be where the majority of the win-potential is found – so, without further ado, let’s get started! If you manage to land three, four, or five of the Sheriff Badge scatter symbols anywhere in view, you’ll trigger the main Free Spins Bonus. You’ll then receive just seven free-spins. That may not sound like a lot, but in fairness to RTG, it’s enough when you see how it all works. Now, during the free-spins, one of the two features is activated. You can choose which of the two bonuses accompanies the spins, and the first is based around the Redhead. f you select this feature, the Redhead outlaw character will become wild on the first reel, and act as a sticky wild. She will also serve as a scatter symbol, and landing a further three, four or five of her anywhere in view will activate the main free-spins bonus. Now, the second bonus is based around the Blonde outlaw cowgirl. She will then become a sticky wild on either reel 5, or, reels 4 and 5 – and this makes it substantially easier to hit some big wins. It’s possible to re-trigger both features, and doing so will award you an additional seven free-spins. There’s no limit to how many times you can re-trigger the feature, meaning – potentially – you can enjoy unlimited re-triggers! While Trigger Happy relies on a pretty standard, overused theme, RTG manages to pull it off relatively well, and it’s nice to see the developer utilising a theme in this kind of way. The fact that the slot is built using HTML5 ensures that players on mobile devices can enjoy the action as well – and this allows you to enjoy playing the slot from virtually anywhere in the world! Overall, Trigger Happy is a pretty decent game, and if you’ve not yet played it for yourself, you will do wise to give it a go! 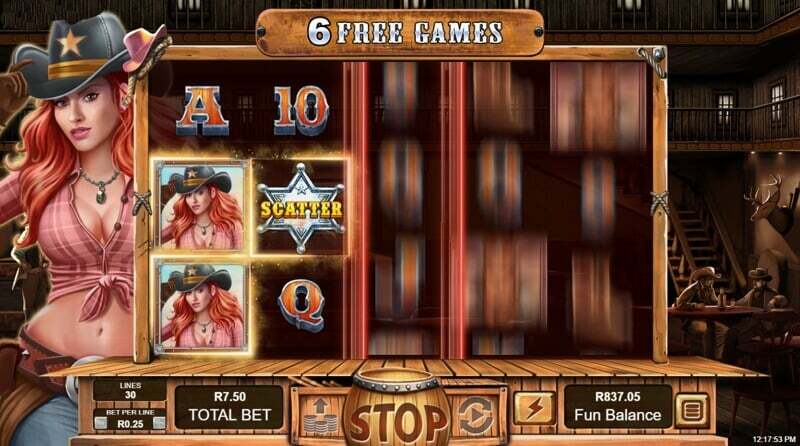 Game description: Trigger Happy is a video slot game from Realtime Gaming (RTG), and while you’d be forgiven for thinking it’s based around the popular TV show of the same name, it’s actually a Wild West-inspired video slot. Trigger Happy is a fun wild west themes slot game with great bonus features.